USC - Taking a look at the Briana Gilbreath-Ashley Corral legacy. Cal - Layshia Clarendon is a quiet superstar. Best quote: "But when the drama is at its highest, Clarendon is at her best." Yvonne Anderson and Chassidy Fussell both eclipsed the 1,000-point mark in Texas' win last night over Missouri. The Fennellys make Iowa State go. Conference coaches praise Nebraska, their newest member. ESPN says Michigan is on the rise. This is dope - ESPN and Facebook will team up to show conference tournaments. Favorites, dark horses, "keep an eye on"s.
Janee' Lewis leads the Franklin Quakers into the state 3A basketball tournament this week. She got her competitiveness from her football-playing father. Tonight Old Dominion hosts Towson in their final regular-season home game, during which they will honor senior Tia Lewis. The 6-foot-3 center/forward leaves the program as the seventh player of all time to record 1,000 rebounds - only 21 away from being fifth in school history. She is eleventh on the all-time scoring list, with 1,586 points. Lewis recorded a career-high 30 points in the Jan. 4 Georgia State game, and she has had 11 double-doubles this year. 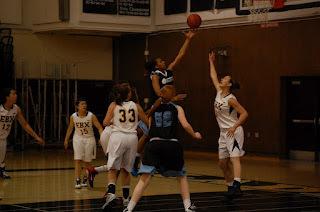 She leads the team in scoring this season with 16.6 points per game, and her rebound average is 9.1. "She has continued to lead an unbelievable legacy here at Old Dominion University," first-year Coach Karen Barefoot said. "I'm just so proud of what she's accomplished this year so far. I think she's really lead our team by the way she competes hard every game." "She's done it on both ends of the floor, and she's had to help rebuild this program, and she's just done a tremendous job. She'll be missed, but she'll never be forgotten because she's done some amazing things here at Old Dominion." 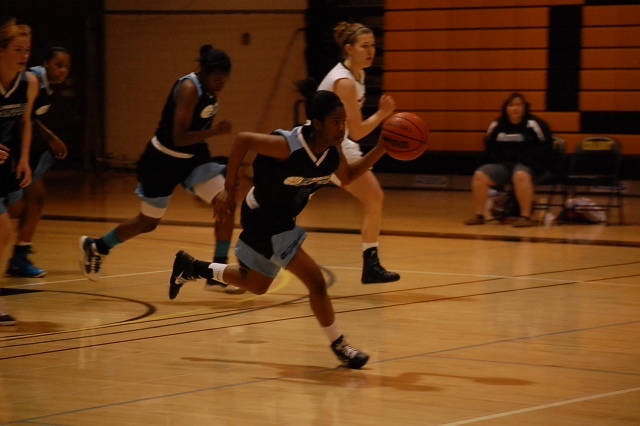 Lady Monarchs fan Tawanna Washington was impressed with Lewis' game, because she said she does it all. "She handles the ball well, she's a rebounding machine, and she gets on the floor for every loose ball," Washington said. "She plays almost 40 minutes a game because her team needs her. And she has a nice 10-15-foot jumper." Tonight's game begins at 7 p.m. Eastern Standard Time. Is there an unsung hero who deserves more recognition than what she gets? Hit me up on twitter.com/hoopism, or hoopism@yahoo.com. March madness is coming! Heck, if it wasn't for leap year, it would begin tomorrow. Conference tournaments begin tomorrow with the Atlantic Sun, and run through March 11. Here is the exciting list. Rebecca Lobo asks Skylar Diggins five questions. Florida's Jennifer George is embracing her leadership role. Western Kentucky athletic director Ross Bjork commented on the state of the women's basketball program. The Minnesota Lynx signed and traded Charde Houston and the 24th pick in the 2012 WNBA Draft to the Phoenix Mercury in exchange for the 18 pick in the 2012 WNBA Draft. The Connecticut Sun signed Sidney Spencer. The Chicago Sky signed Felicia Chester. #3 Notre Dame dropped #4 UConn 72-59, and clinched the Big East title. Wow. Surging #25 St. John's beat #13 Georgetown, 54-45. #17 Louisville over Seton Hall; #20 Rutgers defeated Marquette; #18 DePaul took down Cincinnati; Villanova held on to beat Syracuse. The Big East Tournament bracket is set. Also.....#1 Baylor hung on to win again - this time over Texas A&M. Coach of the year is Penn State's Coquese Washington. If only Pat Summitt could coach forever, muses one writer. Lady Vol commit Bashaara Graves talks about her pre-game music rituals. Dishin & Swishin talks to Sparks Coach Carol Ross. The Tulsa Shock have signed Jene Morris. The Seattle Storm have signed veteran Tina Thompson. Check out my story on USC's victory Saturday over Arizona State, which included a ceremony honoring the team's seniors prior to the game. It was great to see Jacki Gemelos in full uniform again, and it was touching to see the love between members of the Gilbreath family. Cappie Pondexter was 4-for-4 in the shooting contest at NBA All-Star weekend. Video recap. And photos. Tamika Catchings participated in the Dribble to Stop Diabetes. Lindsey Harding had a carnival. Chamique Holdsclaw talks to the New York Times. Kentucky took the SEC title - their first in 30 years. Tennessee took second place by defeating Florida. It was senior day for the Lady Vols. Georgia thumped LSU to take third place. The SEC schedule has been set. Duke clinched the ACC title. Princeton sewed up the Ivy League title. Delaware finished a perfect home season stand today. They've tied a school record with 26 wins. Speaking of consecutive home wins, Miami has 40. And what would the day be without an upset: #23 Nebraska over #14 Ohio State. What could have turned into a rout became an exciting game in the second half, as St. Bernard rallied to beat #5 Windward, but came up short as the hosts won, 59-52. Windward didn't heat up until just under two minutes to go in the first quarter, when they went on a 9-4 run to close out the period ahead 17-8. The second quarter was all Windward, as St. Bernard kept missing close shots - several under the basket. The hosts used full-court, pressure defense and two of their best weapons - Courtney Jaco (12.6 ppg) and Jordin Canada (11 ppg) - to make the difference. At the half, it was 31-19. St. Bernard surged midway through the third quarter and cut the deficit to 31-35 with about three minutes left, but Windward center Imani Stafford swished a shot to put the lead back to six. Demoria White answered back for St. Bernard, but Windward answered in turn with two consecutive buckets and a Stafford block. They lead 42-35 at the end of three. The last period saw the hosts go up by 11, their biggest lead. St. Bernard again clawed back, but this time could cut it only to seven, two times. Lajahna Drummer, Michelle Curry and Chyanne Butler came up especially strong for the visiting team. - St. Bernard was fearless, and they never gave up. They also never were intimidated by their nationally-ranked opponents; they just kept driving to the basket and trying to grab every rebound - even against Stafford, who is 6-foot-6. They are fiesty.....and also young, which is scary for their future opponents. They need to learn to finish shots, and they could be ranked too. Seriously. - Imani Stafford should be dominating games. Tonight she missed shots under the basket, she shot free throws completely uninspired, and she was a fouling machine. Her whole demeanor wasn't one of urgency whatsoever, which is what it should be in a playoff game. She even got crossed over once in the first half, and fell to the floor (took forever to get up, too). Stafford looks like she has relied on her height in playing basketball for a very long time. There's no reason someone as tall as she is averaged less than 10 points per game during the regular season. - The refs called fouls against St. Bernard to the tune of 10-2 in the second half. The parents were about to go nuts with rage. Then Windward scored those two buckets in a row, and some of their parents turned and mocked the St. Bernard parents. I thought it was going to get ugly for a second, but then all of that just fell away. Thank goodness, because the game was physical enough without having to worry about anything else. - Division I coaches in attendance: Arizona's Niya Butts, Michael Cooper I and II of USC, and Tony Newnam from UCLA. - The intensity of the game was palpable. It's why I love high school ball. Windward moves on to face their next opponent, Serra, sometime next week (brackets will be drawn Monday). Apologies for the few and poor quality photos. The lighting in the Windward gym wasn't working for my camera. St. Bonaventure finished a perfect Atlantic 10 season by defeating Rhode Island. Green Bay has the Horizon League title after a win over Butler. Stanford already clinched the Pac-12 title, but today's victory over Utah was Coach Tara VanDerveer's 700th. Cal clinched the second-place spot in the conference by beating Colorado. Gonzaga routed BYU to take the West Coast Conference title. There were no upsets today! Amazing. Iziane Castro-Marques might be going back to the Seattle Storm. There are 116 Division I games around the NCAA today, and for many, it's senior day, which means it'll be the last time for these players on their home courts. I want to congratulate all the seniors, and recognize the hard work and discipline they've exhibited the last four years. Being a student athlete is a tremendous challenge, and the lessons learned from that experience will remain for a lifetime. I hope every senior can reflect today on the tremendous blessings they've experienced through their basketball and school experiences. The heat is on in Texas for coaches Goestenkors, Curry and Henrickson. On the other side of the coin, the field is crowded for Coach of the Year. More on the Lady Raiders.....senior forward Kierra Mallard has been suspended for a violation of team rules. After collapsing during a game last night and being hospitalized, Long Beach State freshman Bianka Balthazar is in good condition today, thankfully. Maryland Coach Brenda Frese stays positive as her son battles leukemia. #7 Duke beat #5 Miami to clinch the top seed in the ACC. The National Team's exhibition schedule has been unveiled, along with a new logo. Apparently Tamika Catchings' East team won the celebrity game at NBA-All Star festivities, but there is only one game picture of her playing that I can find (though it was tweeted that she blocked a shot by R&B singer Ne-Yo). One photo I did find on the dot-com was of Catchings and rapper Common, before the game. The Liberty signed Kelly Miller. The new entity will feature 11 high school teams playing in three sections of California: Norcal, which includes Sacramento and the Bay Area; Central, consisting of Fresno and Bakersfield players; and SoCal - six teams from the greater Los Angeles area. "The overall service mission of both entities is to position our group as a state wide provider of developmental elite girls basketball," Kinnebrew said. "Michele is known for her commitment to young women in Northern California at both the scholastic high school level and club arenas." "I respect Elbert," Massari said. "He's very truthful, and there are a lot of people in the game who aren't." "Players are expected to stay with their own area teams unless it is determined by all directors that a team move becomes necessary for a particular player," Kinnebrew said. "But that is not expected at this time." Pictured below are two current players from Massari's program (pictures by Norcal Elite) and two pictures from the Cal Sparks' FILA Nationals win in 2010 (pictures by me). Arkansas over #9 Tennessee, 72-71 in overtime. The victory was the first for the Razorbacks in Knoxville. The loss, coupled with Kentucky's win over South Carolina, drops the Vols into second place in the SEC. The Lady Vols were distraught: Shekinna Stricklen had be be picked up off the court by Kamiko Williams. Also, Long Beach State's Bianca Balthazar collapsed on the sidelines of a home game against Cal Poly tonight, and the 49ers opted to forfeit as she was taken to the hospital. Preliminary reports are that Balthazar will be allright. San Diego State - one of the nation's most improved teams this year - are the Mountain West Conference champions. Stanford owns the nation's longest winning streak, and they extended that to 77 tonight with a victory over Colorado. It was Coach Tara VanDerveer's 700th win, and senior Nnemkadi Ogwumike surpassed Kate Starbird to move into second place on Stanford's all-time scoring list. Samantha Prahalis destroyed Ohio State's single-game scoring record in tonight's romp over Minnesota: she put up 42. Dishin & Swishin exclusive - Pokey Chatman discusses the signing of veteran Ticha Penicheiro. Los Angeles traded reserves Natasha Lacy and LaToya Pringle to Washington in exchange for Nicky Anosike, an All-Star center. The Sparks also have the No. 1 pick in April's draft and are expected to select Stanford forward Nnemkadi Ogwumike. Couple Ogwumike and Anosike with returning young stars Candace Parker, Jantel Lavender and Ebony Hoffman, and there appears to be little room or salary-cap space for Thompson on the L.A. roster. This trade and signing season for the WNBA is proving to be as wild as this year's NCAA season. The Sparks, the Mystics and the Storm have a lock on power moves. Who will join them? And field narrows.....quarterfinals next Wednesday. LOS ANGELES – The Los Angeles Sparks have signed point guard Sharneé Zoll to a free agent contract, Vice President and General Manager Penny Toler announced Thursday. Per team policy, terms of the agreement were not disclosed. The 5-foot- Zoll graduated from the University of Virginia in 2008 as the Atlantic Coast Conference’s all-time assist leader (785) and has played extensively in Europe over the past four seasons, the last two with CCC Polkowice in Poland. Currently leading the Polish League in assists (6.0 per game) for a second straight year, Zoll has also helped Polkowice reach the knockout stage of the 2011-12 EuroLeague. Among her teammates is Sparks center Jantel Lavender. Zoll was a three-time All-ACC performer at Virginia, where she broke Dawn Staley’s school and ACC record for career assists. The Marlboro, N.J., native scored 1,169 points in her four-year Cavalier career, and as a senior was a finalist for the Nancy Lieberman Award, given to the nation’s top point guard. Starting all but one of her 132 career games at UVa, Zoll was a three-time team captain. 2011 MVP Tamika Catchings has risen again. Cal State Northridge assistant media relations director Geoff Herberg has compiled a list of the most improved programs this year. To no one's surprise that's been reading this column, CSUN is on top. Coach Jason Flowers and his staff have done an amazing job rebuilding the Matador program. ESPN is watching the stars of high school basketball. But they missed one of the biggest in the hoops constellation: Mercedes Russell of Springfield, Ore. The 6-foot-5 junior this season is averaging 28.25 points, 15.4 rebounds, 6.5 blocks, 4.6 assists, and has an 82 percent free throw shooting percentage. Russell, who always shows up for big games, had one outburst for 35 and another for 32 points this year, as the Millers try to defend the state title they won last year. Yep, Shanay Washington tore her ACL last night during Baylor's win over Texas. Just heartbreaking. When will it stop??????????????????? Holdsclaw was in Knoxville today for the Big Orange Tipoff Club's final gathering of the season. 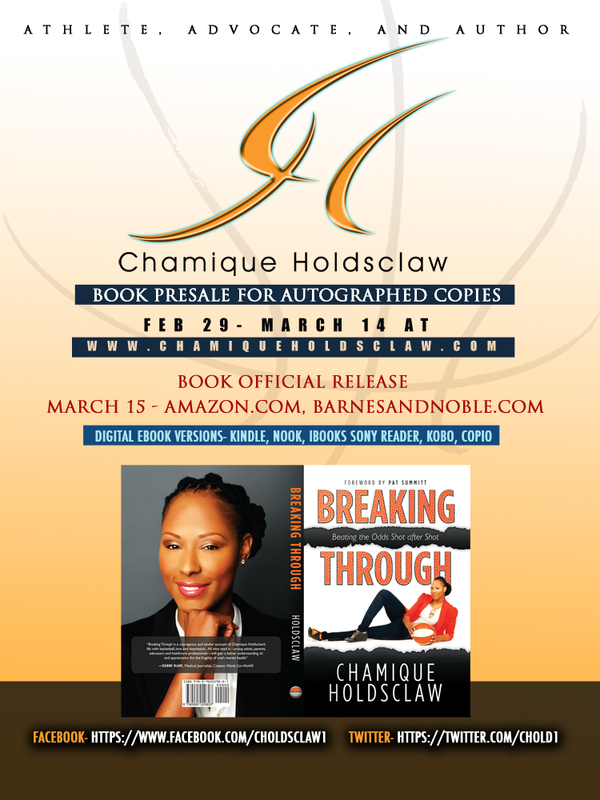 She spoke about her time in the WNBA, her new book, and her work as a mental health speaker. The video of her talking about her book is good, but the video of her talking about her time in the WNBA might require a tissue or two. Her book, "Breaking Through: beating the odds shot after shot," is scheduled to be released mid-March. Well this one sure slipped by: The Washington Mystics traded Nicky Anosike to the Los Angeles Sparks in exchange for Natasha Lacy and LaToya Pringle Sanders. No announcement from either team? Just a tweet a few hour from Anosike saying there would be "a big announcement coming soon"? And Candace Parker and Nicky Anosike together again? This season is already intriguing. Chicago Sky sign veteran point guard Ticha Penicheiro. I guess she's not retiring. The Sparks are going to be on fire this year. #1 Narbonne vs. #5 Carson, 2 p.m.
#3 El Camino Real vs. #2 Fairfax , 4 p.m.
Notes: Championship, Mar. 3 (6 p.m. at Cal State Dominguez Hills). #6 Eagle Rock vs. #2 Monroe, 6 p.m.
#1 Palisades vs. #4 Los Angeles Roosevelt, 8 p.m.
Notes: Championship, Mar. 2 (6 p.m. at Roybal). #9 Los Angeles Marshall vs. Cleveland, 2 p.m.
Notes: Championship, Mar. 3 (1 p.m. at Cal State Dominguez Hills). All my horses are out of the races, so it's official: I have no investment in any state titles in these parts. Two upsets - Oklahoma dropped #11 Texas A&M, and Syracuse took down #18 DePaul. In the battle of the giant slayers, it was #25 St. John's over West Virginia. The Red Storm have won 12 of their last 14 games, including Saturday's big victory over UConn. #1 Baylor clinched the Big 12 title, but may have lost guard Shanay Washington to knee injury yet again. Auburn Coach Nell Fortner is resigning. Writing on the wall? Gulf Coast State College Roonie Scovel will step down, and become an academic adviser at the school. 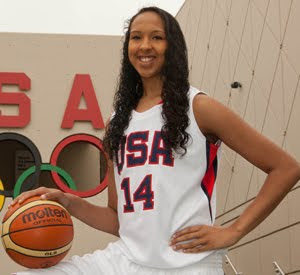 Check out Tamika Catchings modeling the new USA Basketball uniforms. Somebody's been in the weight room! The Mystics re-signed Monique Currie, and the Sky re-signed Tamera Young. The beginning of the exodus? A legend retires: Sharon Fanning-Otis will retire as coach at Mississippi State at the end of this season, after 36 years in the business. I've heard rumblings that, due to conference realignments and accompanying TV deals, that this spring will see numerous coaching changes - the likes of which we may not have seen before. Don't say I didn't warn you: change may be coming. Penn State upset #9 Ohio State, and in the process clinched the top seed in the Big Ten Tournament. They've come a long way. Notre Dame moved a step closer to taking the Big East title, with a win over Louisville. With their stunning upset of UConn Saturday, St. John's announced their arrival noisily. ESPN comments on the wave of upsets that have become a regular thing this season. San Bernardino's own Layshia Clarendon was named Pac-12 Player of the Week. The Cal guard averaged 24.5 points and five rebounds in leading her team two a pair of wins last week. Yesterday was a day to celebrate in the Land of Troy, at USC. Not only did the Trojans sweep the Bruins in this year's series with a 66-54 win, two of the school's greats saw their jerseys retired. Pamela and Paula McGee were honored at a halftime ceremony, and Cheryl Miller, Lisa Leslie, Linda Sharp and Rhonda Windham were also on hand to show their support. Sometimes I miss the good ol' days in women's hoops. #7 Maryland gave #5 Duke their first ACC loss.....63-61. Florida 61, #15 Georgia 57. In overtime, it was Michigan State 67, #19 Purdue 52. (What a colossal meltdown that must have been). #6 Miami has now won 13 consecutive games, including today over Florida State. They're now sharing the lead atop the ACC. #9 Delaware barely escaped an upset by Drexel - 40-39. No true surprises from last night's first-round results, as the usual top suspects - Mater Dei, Long Beach Poly and Brea Olinda - advance. It's been almost a year since Middle Tennessee State's Tina Stewart was stabbed to death. Last night - senior night - the Lady Raiders paid tribute to their fallen teammate, with her parents present. The lump in my throat is exacerbated by the T-shirt Stewart's father is wearing in the picture. Junior Shenneika Smith's three-pointer with eight seconds to go lifted the St. John's Red Storm over #2 UConn, snapping the Huskies' 99-game winning streak that dated back to 2007. No doubt, the biggest upset of the year so far. Pictures, including the game-winning shot (far right, third row....looks like some of the UConn fans can see what's about to happen). #1 Baylor narrowly avoided an upset of their own, holding off Texas Tech, which lead the game much of the way. Baylor clinches at least a share of the Big 12 title. Speaking of titles, Stanford grabbed the Pac-12 title outright today with a win over Oregon. It's the first title of the new conference. #12 Green Bay also held off an upset, overcoming Youngstown State in overtime, 77-72. West Virginia was trying to pull off their third upset, and had #20 DePaul by 14. But the Blue Demons surged back for the 77-63 win. Cal's victory today over Oregon State puts them at 20 wins on the season. San Diego State earned 20 by stuffing Air Force. The Matadors trailed UC Davis by 15, but rallied for the 63-60 victory. Deep: Tennessee assistant coach Mickie DeMoss has been on this road before. UC San Diego students will vote whether or not to move from DII to DI. It's the UCLA-USC rematch, this time in the land of Troy. There will be a jersey retirement ceremony at halftime for Pam and Paula McGee. Like the Jackson Five, I'll be there. 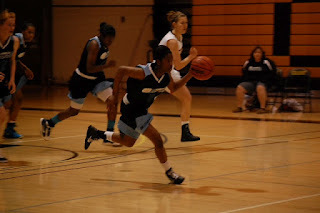 Jacki Gemelos, Carolyn Davis, Kristi Kingma, China Crosby, Richa Jackson and Antonye Nyingifa are just a few of the many, many basketball players who have torn their Anterior Cruciate Ligaments (ACL) this year, which put them out for the season. It's a storyline hoops fans unfortunately know well, as female athletes have long been known to sustain ACL tears at far greater frequency than male athletes. It is estimated that a staggering 38,000 women suffer ACL tears annually - a rate that is two to eight times more than the rate for men. It seems like to many, more of these injuries have occurred in collegiate hoops this year than usual. The disparity has been commonly attributed to one or a combination of these factors: the angle of the femur to the knee with the wider hips of females; different muscle recruitment patterns during movement and landings; and hormonal changes during menstrual cycles causing joint laxity. Interestingly, as can be seen from the same above link, the majority of ACL tears in women occur during non-contact events, such as deceleration activities that happen when landing from a jump, or cutting. This was known at least 17 years ago. With this in mind, it is outrageous that the NCAA hasn't done anything to actively prevent ACL tears in its female athletes. Biology is one thing, but preventative jumping and cutting techniques can - and should - be taught. I'm sure there are some strength and conditioning coaches out there that already do this, but clearly, there need to be more. The NCAA needs to mandate that all such coaches teach proper deceleration technique to athletes. Further, they need to train head and assistant coaches to make sure that athletes follow the protocol in regular practices. Every athlete that loses a season, or a career, due to an ACL injury is one too many. Unless widespread coaching education is implemented, the problem will continue, and may get even worse as the athleticism of the game increases significantly every year. It is time for the NCAA to take a pro-active approach and develop a program to prevent ACL tears. Now. So many divisions, so many games tonight. #2 Mater Dei tries to defend their title, taking on King. #1 Long Beach Poly takes on Valencia. In Division 4A, Sherrise Smith's #9 Marlborough team visits #8 LaSalle, in what promises to be a fiery contest. This is only the first and second rounds of much more great basketball to come. Despite the presence of other monster players like Skylar Diggins, Elena Delle Donne and Nnemkadi Ogwumike, ESPN says Brittney Griner leads the race for player of the year. (Love that the story reminds me of the "back in the day" WNBA commercials). Griner may not be the best player, but she's the most dominant. Scary....nine Pacific University ball players were hospitalized with the flu today. They are rescheduling their game against Long Beach State. Duke sophomore Richa Jackson has torn her ACL and is out for the season. St. Bonaventure dares to consider that they might go to the big dance this year. Debbie Antonelli and Beth Mowins talk March Madness with Cheryl Coward and David Siegal from hoopfeed.com, and Stephanie White. Behind the scenes of the selection committee process. Lindsey Harding, Cappie Pondexter, Marie Ferdinand-Harris and Sophia Young will compete in the NBA Haier Shooting Stars event Feb. 25. (Don't mind the typo headline that gives the wrong year). Scholanda Dorrell (formerly Robinson) will return to the Tulsa Shock. The Silver Stars have added Ify Ibekwe, Kalisha Keane and Latoya Williams. The Mystics have signed Ashley Walker, Kerri Gardin, Laura Harper, and they re-signed Crystal Langhorne. And Tulsa Shock Coach Gary Kloppenburg's plans for the team don't include Sheryl Swoopes or Betty Lennox. Dishin & Swishin talks to Miami's Katie Meier and WVU's Mike Carey, among others. Another fine broadcast of Pac-12's "Inside the Paint," with Roslyn Gold-Onwude. Tennessee guard Meighan Simmons' 25-point outburst Monday night against Kentucky inspired the entire team. Lauren Jackson, Penny Taylor, Suzy Batkovic, Kristi Harrower, Belinda Snell, Liz Cambage, Abby Bishop and Jenna O'Hea headline the list for Australia's prospective basketball team Olympians. It may be the strongest that list has been in many years. The Women's Sports Foundation has named Tamika Catchings one of its four new trustees. Salina, Kansas, will name its Bicentennial Center Basketball Court after native Kurt Budke. The dedication ceremony will be March 24, during the NJCAA Women's Basketball Championship tournament. Kansas has to step up in the absence of Carolyn Davis, who is out for the season. But they had a misstep tonight, falling 47-66 to Iowa State. To avoid another beat down, Kentucky Coach Matthew Mitchell says the Wildcats need to shoot better against zones. Arizona State is nursing injuries. It's West Virginia again, this time taking down #18 Rutgers, 60-50. Karl Benson is leaving the Western Athletic Conference after 20 years to be commissioner of the Sun Belt Conference. The Dream re-signed Coco Miller and Courtney Paris. ESPN sees the Sparks' acquisition of Alana Beard as the most intriguing transaction so far in this off-season. Despite the loss of their longtime coach, and the impending closure of their school, Nazareth of Brooklyn continues to win. Kevin Hart is schooled by the UConn Huskies. Yes, Oregon State is in sole possession of third place. Hats off to them. They have exceeded expectations. Here are some highlights from the Cal website of last Saturday's overtime loss to USC. All that passion is one of the beautiful things about the college game. The Storm traded Ashley Robinson to the Mystics in exchange for Victoria Dunlap. Seattle also re-signed Katie Smith. The Fever re-signed Shyra Ely. The Liberty have re-signed Leilani Mitchell. The Dream signed former Mystic Laurie Koehn to a training camp contract. Anjale Barrett makes the Maryland Terps better. UW-Milwaukee twin frosh Janna and Jasmine Swopshire cause double-takes on the court. Married CSUN coaches Jason and Tairia Flowers make it work. Claremont-Mudd-Scripps Coach Jodie Burton has notched her 500th win. The Pac-12 broke ground on its new San Francisco studios today. West Virginia has settled its lawsuit with the Big East, and will move to the Big 12 in July. Texas is asking fans for patience with the new Longhorn Network. Kate Starbird has gone from on-court genius to academia master. And perhaps the biggest news of the day: THERE WERE NO UPSETS in college basketball. #11 Tennessee didn't just upset #7 Kentucky tonight - they handed them their behinds. Final score: 91-54. The Lady Vols crashed out of the gates and played some of the most urgent, feverish and complete ball that we've seen in a while, dominating the Wildcats from beginning to end. Tennessee's tone was on display early in the first half, when sophomore guard Meighan Simmons (who lead the Vols with 25 points) and senior forward Shekinna Stricklen (18 points) forced a key turnover, together. They started screaming at each other and chest bumping like they were about to win the championship. Govolsxtra writer Dan Fleser said it looked to him like the Lady Vols were playing "almost angry." Whatever it was, it was something to behold. Govolsxtra wants to know how far you think Tennessee can make it in the NCAA Tournament. Minnesota upended #15 Nebraska, 64-58. Kansas forward Carolyn Davis will miss the rest of the season after both tearing her ACL and dislocating her knee in yesterday's game against Kansas State. There is no handbook for Associate Head Coach Holly Warlick's role now that Coach Pat Summitt has early-onset dementia. Don't harp on Summitt's illness, says one fan. Sites for the first and second rounds of next year's tournament have been chosen. The Mountain West Conference and C-USA will form a new conference. The Tulsa Shock has re-signed Jennifer Lacy to a multi-year deal. The Atlanta Dream has signed Aneika Henry to a training camp contract. The Minnesota Lynx have signed free agent Erin Thorn. Lots of new faces, including the only collegian on the list, Brittney Griner. Who are the for-sure selections? Who is on the bubble? Motivation has always fascinated me. I have books on the topic; wrote papers about it in grad school. Any coach that's worth anything knows that motivating players is just as important as teaching them skills. You can tell when a coach knows how to do this, because their players play hard, and they give it their all, every time they step on the court. This week I asked three West Coast coaches to give me their philosophies on motivating athletes. The coaches I chose each have teams that are experiencing a bit of adversity this season. Yet, players on these squads leave everything on the floor and often win despite their circumstances - and over teams that were expected to beat them. Coach Lindsay Gottlieb just took over the Cal program this year. She has four freshman on her roster, four sophomores, four juniors, and no seniors. The Bears are in second place in the Pac-12 Conference, and two of the freshmen - Reshanda Gray and Brittany Boyd - are second and third on the team, respectively, in scoring. Coach Greg McCall took the helm of the Cal State Bakersfield program this year, and the Roadrunners have been decimated by injuries - five, to be exact. This has left them with six suited-up players for most games. Yet they harass and suffocate other teams, coming very close to beating many of them. They never give up. The situation at UCLA is very similar. New Coach Cori Close saw her leading rebounder out for the season in September, and four more key players have followed, leaving the Bruins with a very thin bench. Yet they are relentless and have won some key match ups. Improbably, they are tied for third in the Pac-12 Conference. What do you do to motivate your team to play hard and win? As a coach, what do you think is important to impart to a team? At the most foundational level, I believe strongly that the best motivational factor for female athletes to play hard and win is to let them know you care about them as people and athletes. I have found that my players will run through a wall for me when they truly believe that I have their back in all situations. Secondly, I believe in empowering players to see how good they could be...to believe in their potential. If a coach can successfully impart a belief in self, then that coach will also be able to reach players on technical and tactical corrections. To get them to play hard, I want them to know that we have to get better each time we set foot on the floor for practice and games. In order for them to do that we have to give 100% effort each drill in practice or each possession is games. I try to get to know them as best I can and build relationships so you know the character of your team. If you don’t build relationships and you don’t know who they are collectively and individually, it’s really hard to pick the right mode of motivation. After that, you choose, whether you need to be harder on them or to praise them more, you’re doing that as a response to knowing who they are as young women and as a collective unit. Giving them a greater yes, and what I mean by that is instead of harping on them about what they aren’t doing to motivate them, to give them a stronger sense of your goal and vision. The more their eyes are strictly focused on what they want to accomplish, the more willing they are to overcome the hurdles or the obstacles to get around to that goal. It’s intensifying what the goal is so there is more motivation to minimize the distractions. Cal and USC took it to overtime, and the Trojans slipped by the Bears 76-75. Freshman point guard showed up big for USC, scoring 21 points - 11 of them in the extra period. This freshman class is so very talented. Oregon fought back from behind to beat WSU, 67-62. Amanda Johnson lead the Ducks with 23 points - 18 of which were in the second half. Lots of great, close games today. But the biggest surprise so far is West Virginia's 65-63 upset of #2 Notre Dame. What?? Wrap-up of today's "Play4Kay" action. Tomorrow night, #7 Kentucky visits #11 Tennessee. Preview. Will the NCAA hear Drey Mingo's plea and give the Purdue forward a sixth season of eligibility? I sure hope so. #1 Baylor destroyed defending NCAA champs #14 Texas A&M 71-48. #9 Green Bay rebounded to defeat Wright State, and #18 Gonzaga returned to form to beat San Francisco. Oregon State is now 17-7 after taking Washington, 78-73. CSUN and Long Beach State just went into overtime. The Pac-12 has some late-night games, as Cal hosts USC and Washington State hosts Oregon, both at 8 p.m. PST. Princeton is still perfect in the Ivy League. Oklahoma's Joanna McFarland is back after having missed six games due to a broken jaw. The struggles of Tennessee continue. UConn's Caroline Doty is finally getting comfortable. Kentucky's A'dia Mathies is handling increased attention. St. Anthony's of Huntington, N.Y. has upset #2 Riverdale Baptist. Merit Management, Inc. is hosting it's 15th annual Free Agent Camp on April 1 in Denver, Colo. - the site of this year's NCAA Final Four. This year's event will be at Denver East High School. An application is available here. Those selected are invited to camp, and often drafted by WNBA teams the following week. Merit Management President Stephanie Stanley said the camp should be competitive, as usual. "This year our goal remains the same, which is to provide a platform for top players to be evaluated and signed to professional contracts," Stanley said. "This is an invite-only event, so the camp is extremely competitive and loaded with talent. "To date, 36 players have signed WNBA contracts for full season or training camp as a result of their participation in our camp. We've even had two players get drafted (Martina Weber and Emily Fox)." Players who were signed after participating in the camp include Breanna Salley, Rashidat Juniad, Jennifer Lacy, Kelley Gibson, Octavia Blue, Kisha Ford, Leigh Aziz, Juana Brown, Ta'Shia Philips and Vivian Frieson. More information about Merit Management is here. Check out my piece on the newest Spark, and the rest of the team. In other news, the Lynx have re-signed Candice Wiggins, and Mystics Coach Trudi Lacey welcomes forward/center Michelle Snow to the team. Perhaps the biggest is Detroit's upset of #9 Green Bay, 70-58. The Phoenix had been unbeaten before tonight; now Baylor is the only team who can claim such a record. Iowa State Coach Bill Fennelly is cleared as cancer-free. Former coach Marsha Sharp is digging her new role in Texas Tech's athletic department. The Nebraska Huskers are hanging tough after a down year. Coach Connie Yori feels fortunate. Skylar Diggins knows what she wants. Dishin & Swishin talks Play4Kay, Stefanie Dolson and Jennifer Azzi. Great piece on Cal Coach Lindsay Gottlieb. The latest broadcast of the Pac-12's "inside the paint." Liz Brenner didn't even come to Oregon to play basketball, but she's making a difference for the Ducks. The Arizona Wildcats are staying positive despite a losing streak. Right now, SEC teams are down in the polls. The Lady Vols are channeling Lauren Avant's defense. Nazareth High School - home to one of the nation's top-ranked girls basketball teams - will close at the end of the year. The program is also being investigated for the possible use of an ineligible player. Sue Bird and Tanisha Wright have signed multi-year contracts with the Storm. Coach Brian Agler talks about it. Michelle Snow has joined the Mystics. The Dream has re-signed Yelena Leuchanka. Katie Collier made the team while undergoing treatment for leukemia. Four California players and one from Washington on the All-American teams, and the West coast still gets no love. No disrespect 2 Stanford but the ACC has 4 teams in the top 10 & total of 6 in top 25. Committee has 2 consider that. Log on and check it out. LOS ANGELES – The Los Angeles Sparks have signed four-time WNBA All-Star Alana Beard to a free agent contract, Vice President and General Manager Penny Toler announced Wednesday. Per team policy, terms of the agreement were not disclosed. Beard, a 5’11” guard/forward, averaged 16.2 points, 4.2 rebounds 2.9 assists and 1.9 steals per game in six seasons with the Washington Mystics before missing the 2010 and 2011 campaigns with ankle and foot injuries, respectively. Prior to her injuries, Beard appeared in 193 of a possible 204 regular-season games dating back to her rookie campaign of 2004, starting 192. She earned WNBA All-Star Game selections from 2005-07 and again in 2009 – three times as a starter – and garnered 2006 Second Team All-WNBA honors. Beard was selected second overall by Washington in the 2004 WNBA Draft from Duke, where she became the first player in women’s college basketball history to claim the John R. Wooden, State Farm Wade Trophy and Naismith Player of the Year Awards as a senior. As a rookie with the Mystics, she earned her first of four consecutive WNBA All-Defensive Team selections and set a new franchise record for steals in a season. Beard’s breakthrough season came in 2006 when she averaged career-highs of 19.2 points (sixth in the WNBA) and 4.7 rebounds while shooting 49.5% from the floor. The following season the Shreveport, La., native was nearly as productive at 18.8 points per game, fourth-highest average in the league. She made three Playoff appearances during her Washington career, most recently in 2009. Off the court, Beard is one of the WNBA’s most community-minded players. She serves as an ambassador for the league’s Dribble to Stop Diabetes campaign, while through the Alana Beard Foundation she fosters a "no-excuse" environment to provide the young women of tomorrow with the necessary resources critical to achieving success on or off court.